The return of Specialist Games? I don’t normally comment on rumours but this one caught my interest as the Specialist Games range was very close to my heart. In case you haven’t seen it, this is apparently an announcement from Games Workshop that has been doing the rounds on the internet. The apparent ‘source’ of this information is a store manager in Australia who was told that he could advertise this in his store. This is not the usual channel for GW to release information. Also, why haven’t we heard similar things from other store managers? GW have just released Betrayal at Calth, a huge Heresy-era board game that they are pushing heavily at the moment. Why make an announcement of this magnitude so quietly in the background? Not only will this not receive much notice but, if it were true, it would detract from their current big release. There have been no rumours at all about this up until now. If GW were working on something there would have been leaks. Just look at Betrayal at Calth, images from this ‘top secret’ project were leaked months before release. Similarly, GW haven’t teased this as they did with all other new games. This doesn’t fit GW’s current business model. They already scrapped the idea of a specialist studio to support a small range of games so why go back to it? I could see GW releasing a one-off board game based on a classic game (much like Space Hulk or Dreadfleet) but not them devoting a whole new studio to specialist games. The poster contains a spelling mistake: ‘Armegeddon’. Now, I know there are occasional typos in GW publications (as there in any publications) but to spell the name of a game wrong in the press release? GW wouldn’t be this sloppy about its IP. I don’t buy the idea that this supposed “Specialist Product Design Studio” will support the Lord of the Rings and the Hobbit. From what I’ve heard, the license to produce products for these franchises is coming to an end. Also, the Hobbit was a flop and received little support from GW when it was in the cinema so why revisit it? What does seem to be the case is that Games Workshop and Forge World have had some kind of internal restructuring and the resulting team is responsible for Betrayal at Calth. This team will be committed to developing further board games in the future. As far as any of the old Specialist Games returning goes, this is very much speculation at this stage. It could happen but this is far from certain. 2014 has been a busy year for me as I finished my PGCE and embarked upon a new teaching job which has been very demanding. The bulk of my hobby activity recently has been helping to run the G.A.M.E.S. club in my school with friend and fellow teacher Mr Taylor. It has been really rewarding to see the kids enthusiasm at discovering and exploring this great hobby. In terms of my own hobby, I did manage to get some time to work on my own models. Here’s a quick recap of 2014 on Miniature Miscellany. 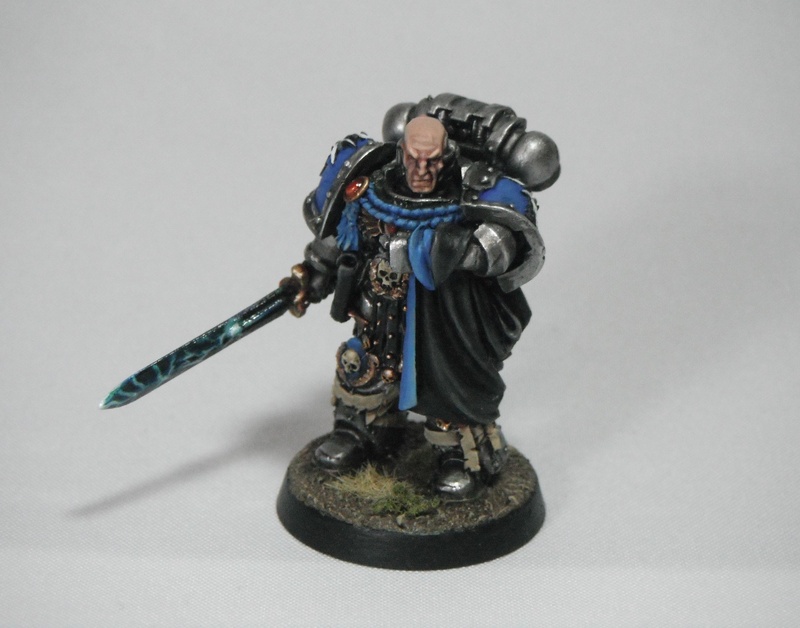 January saw the completion of what has definitely been the most popular series of posts on Miniature Miscellany, my Astral Claws Centurions. These were great models to paint and I am really pleased with how each one has turned out; they all have such individuality and character. I also converted a captain for my Astral Claws. 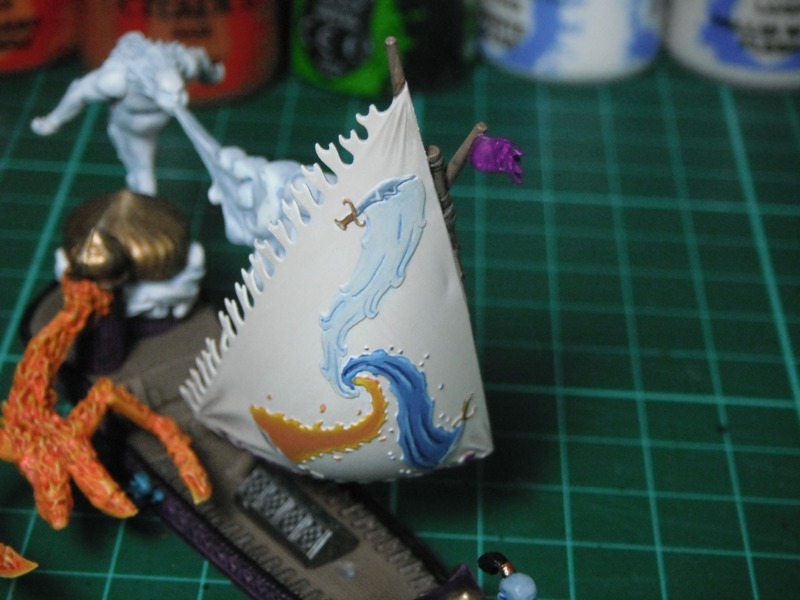 I also continued with my Dreadfleet set, painting up another three ships. This is a fantastic set and has been a real ‘slow burn’ project for me. The models are fantastically detailed and it has been nice to take my time over them. I tend to paint them up occasionally as breaks between other projects which explains why it has taken so long to get through them. In February I painted up some dwarves from the Hobbit using quick and easy techniques (silver spray paint, washes and drybrushing). I’m really pleased with the results of these simple methods. The dwarves from the film have a great design and these are finely detailed sculpts. 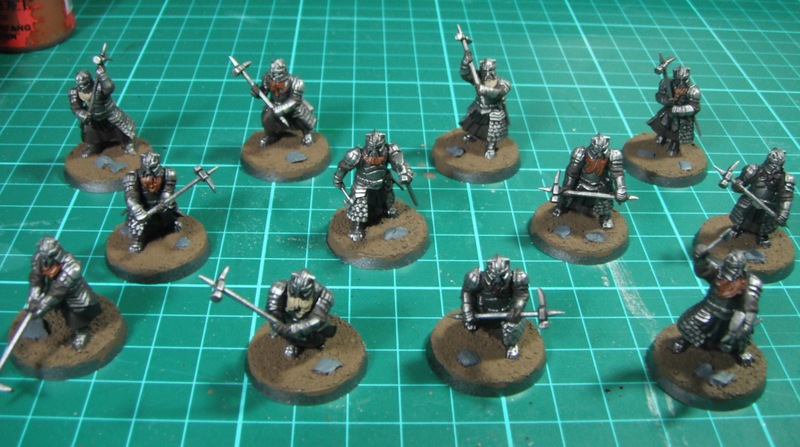 It’s just a shame that there isn’t more variety to the range, I’d love some armoured dwarves with shields and spears. March saw something of a real highlight for me as one of my models was featured in White Dwarf! A boyhood dream come true. 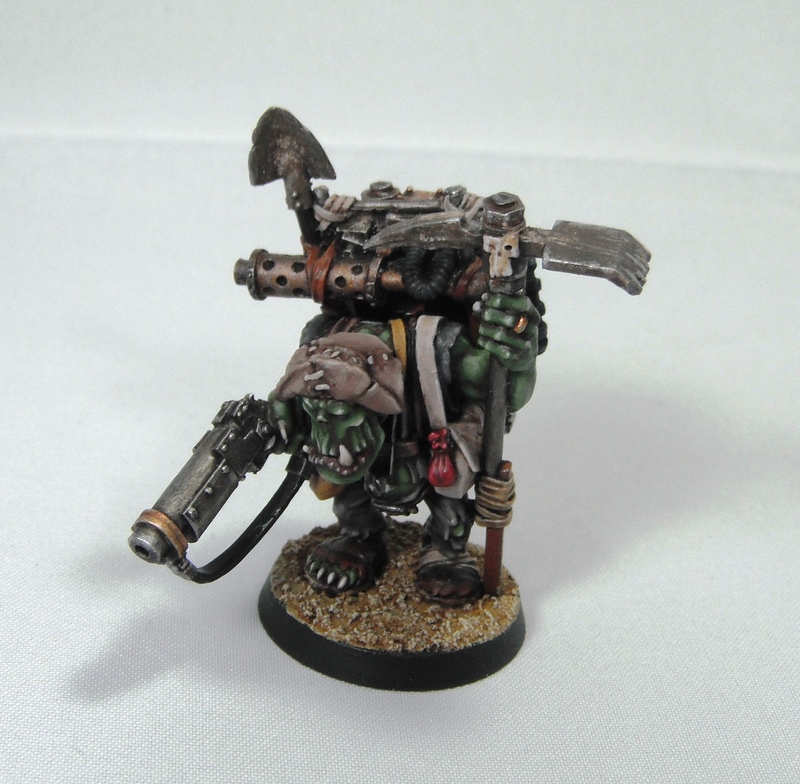 April saw some retro hobby goodness with this classic model from the Gorkamorka range of the late ’90s. I had planned to paint up more orks and do a write up on how to paint ork skin tones but never quite found the time. Perhaps I’ll get round to this in 2015. In May I painted up these Dead Men of Dunharrow using quick techniques (spray paint and washes). 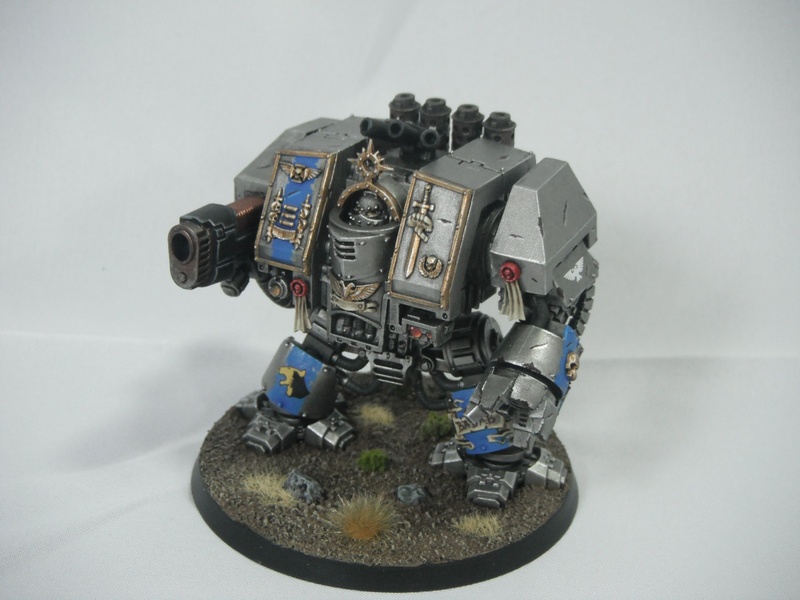 The summer saw some reinforcements for my Astral Claws in the form of a venerable dreadnought and a drop pod. The dreadnought was fantastic fun to paint although I had a few initial problems getting the colour scheme right. 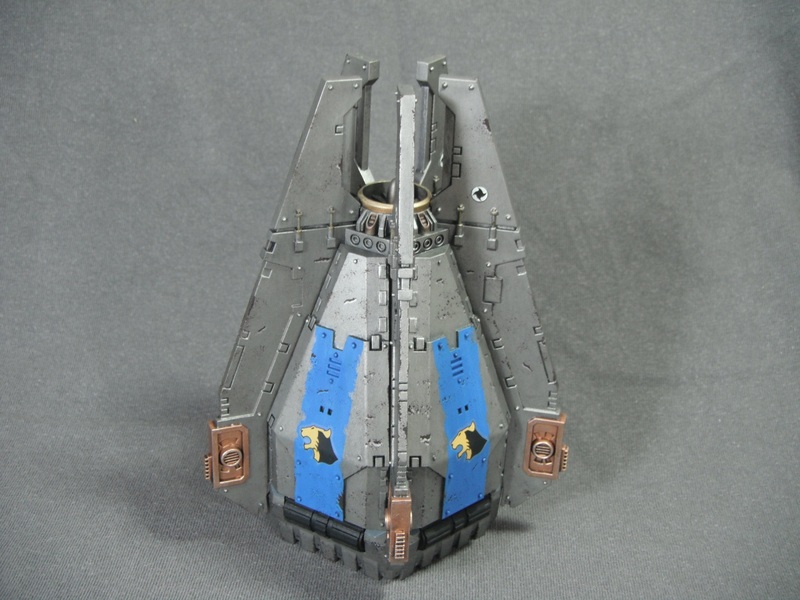 The drop pod, on the other hand, was a real paint to put together as it had to be assembled in lots of sub-assemblies and painted in sections. I’m pleased with the finished result though. 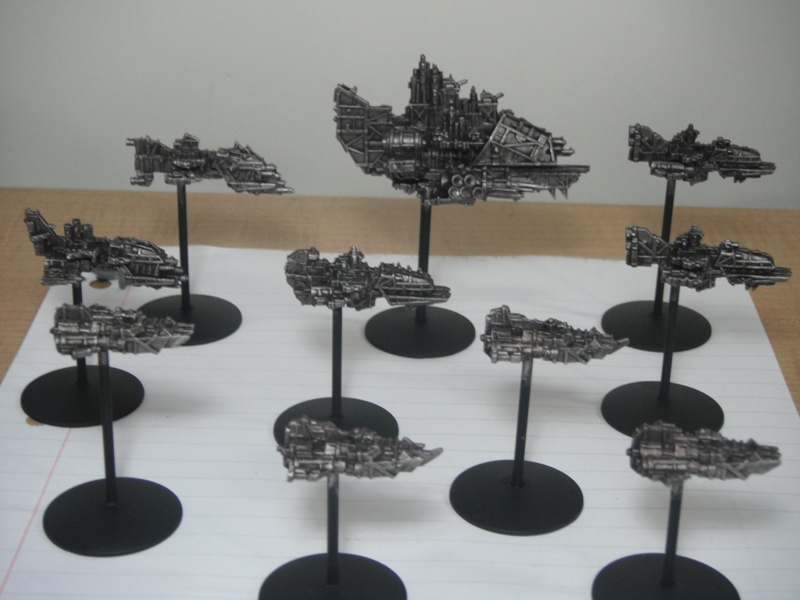 July saw a variety of orcs/orks in the form of some Lord of the Rings uruk hai and my Battlefleet Gothic ork fleet (still a work-in-progress). Perhaps the most ambitious project for me was working on a fully modeled terrain board. In July I finished the first of the board tiles. 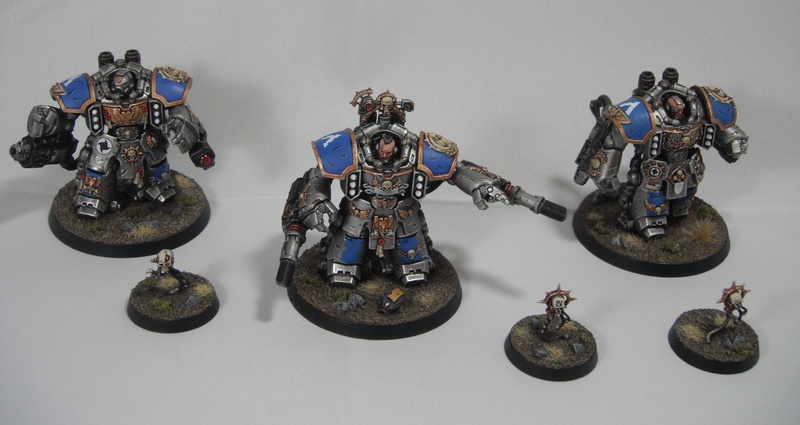 August saw some more work on Dreadfleet and some Astral Claws. September wasn’t a very productive month hobby-wise as I started my new job. I’m pretty sure I did paint something but no blog posts. 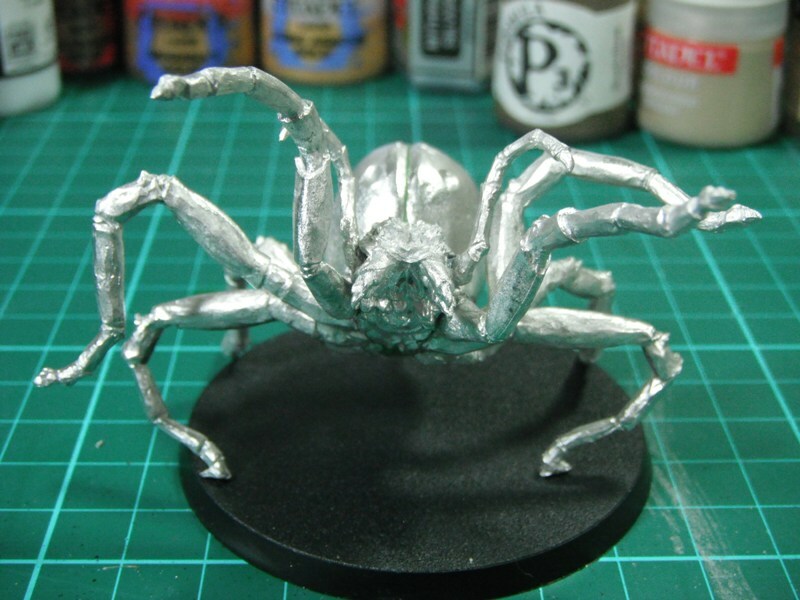 In October I started work on Shelob. Who was finished in November. 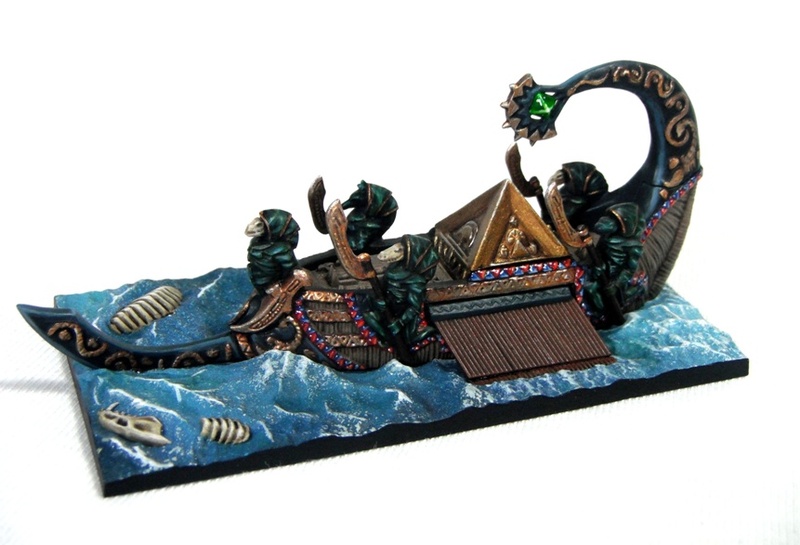 Which brings us up-to-date with some more Lord of the Rings models and Dreadfleet. Not bad for a year’s work. There have also been other side projects which have not made it onto the blog but which I hope to bring to you soon including the start of a warband for Inq28 (inspired by the Blanchitsu articles in White Dwarf and a number of fellow bloggers) and the start of my Space Hulk set. So, what does 2015 hold? I’m not going to make any hobby plans or resolutions for 2015 as I have seen other bloggers out there do. My free time is very precious at the moment and so I tend to paint what ever I am in the mood for when I do get some hobby time rather than trying to discipline myself and be prescriptive. As I don’t really play games at the moment I am not worried about completing armies for painting up certain units to a deadline. However, I do have a few ideas for projects I would like to work on. As I write this I have a Space Marine dreadnought and the Witch King of Angmar primed on my desk and awaiting paint. As mentioned above, I purchased the limited edition Space Hulk set and so I definitely want to get some of those models done. The other day I unearthed three Eldar grav tanks airbrushed red which I would like to finish and which might lead to an Eldar army. 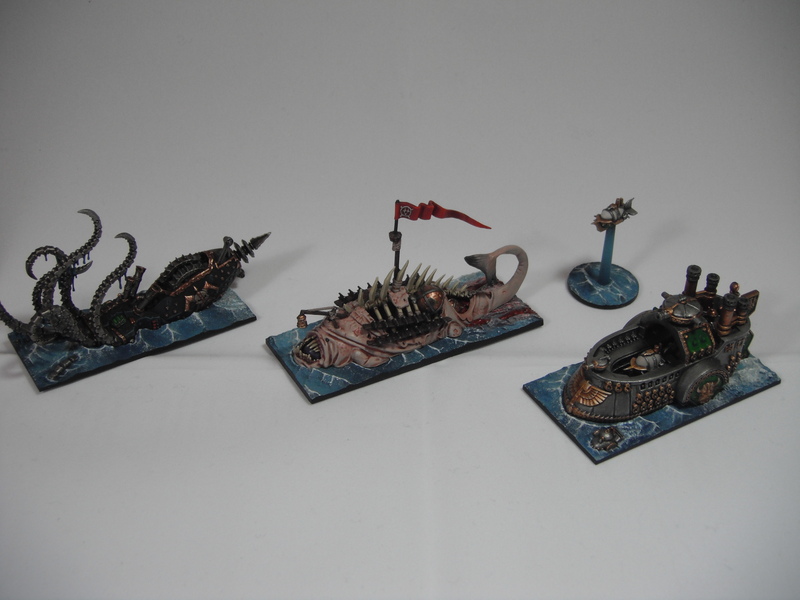 I will also continued to work on Dreadfleet. Who knows, perhaps 2015 will be the year in which the set is finally finished. 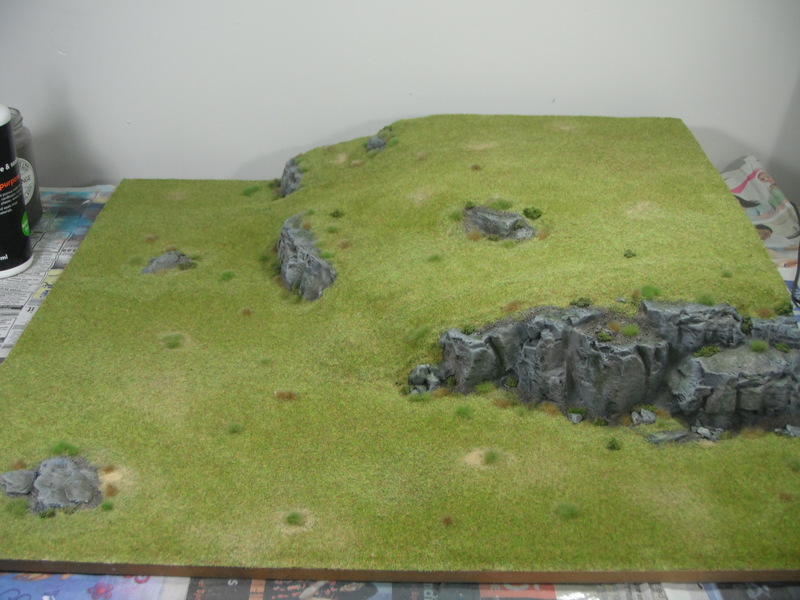 I would also like to continue working on making terrain, an often overlooked but very rewarding part of the hobby. Hopefully some, if not all, of these projects will make it to the blog over the next twelve months. However, you know how it is with Games Workshop. Their release rate at the moment is incredibly prolific and so no doubt there will be something new and shiny released in 2015 that will grab my attention. What about you, readers? Do you have any hobby plans for 2015? 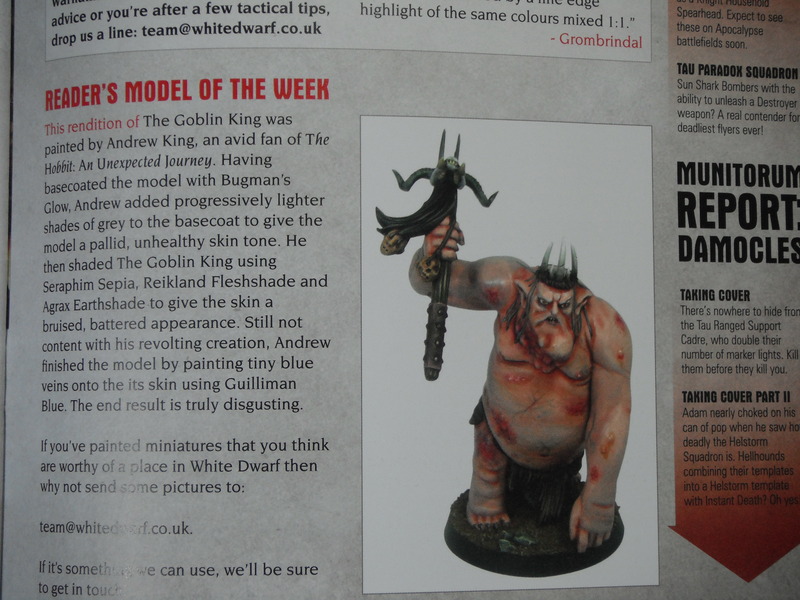 I was insanely happy to discover that one of my models (the Goblin King from the Hobbit boxed set) was featured in White Dwarf magazine! I started reading White Dwarf way back in 1995 at the tender age of 11 and subscribed for many years. It has always been something of an ambition to get something published in the magazine and now that has finally come true. I’ve finished my Dwarf Grim Hammers. As I mentioned in my last post, I used a few shortcuts on these guys and they were very quick to paint with pleasing results. 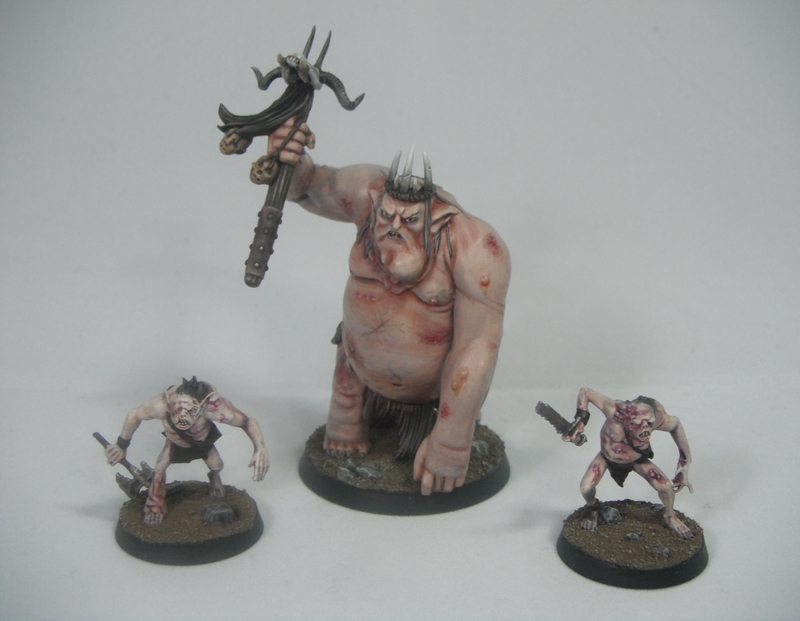 The beards were painted either Mournfang Brown, Rhinox Hide or Zandri Dust and then washed with Agrax Earthshade. They were then highlighted Skag Brown, Gorthor Brownand Ushabti Bone respectively. The cloth is either Abaddon Black mixed with Kommando Khaki or VMC Black Brown mixed with Kommando Khaki (to help differentiate the two areas of black cloth). they were the based to fir in with my LotR/Hobbit collection. I have started work on a set of dwarf ‘Grim Hammers’ from The Hobbit. I have used a couple of short cuts on these models and they have been very quick to paint, just a couple of sessions to get them to their current stage. Firstly, I undercoated the models using Tamiya light gun metal spray. 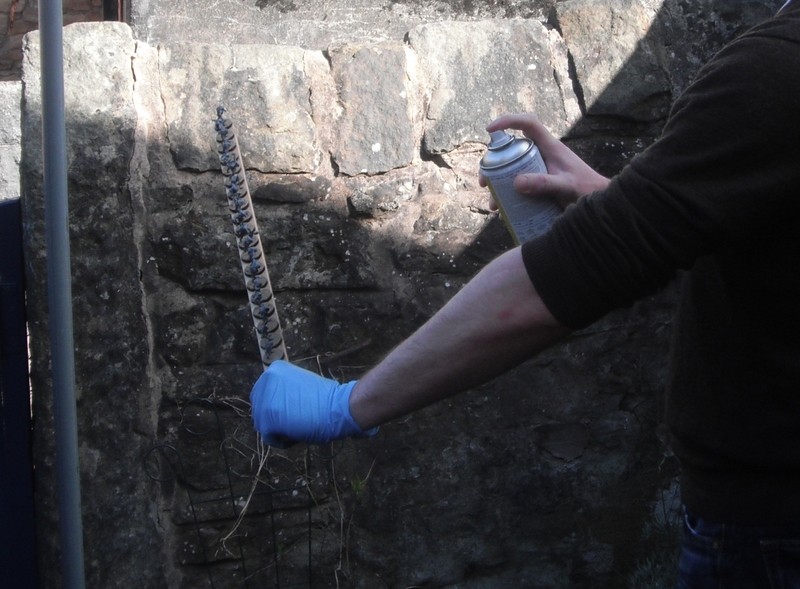 I did this over a black undercoat as my tests found that this gives a better finish than applying it over bare plastic (although you can spray directly onto the plastic but you will need a couple of coats). I then washed the models with Nuln Oil and left them to dry thoroughly. Once dry I gave them a quick drybrush with Necron Compound and then blocked in the basic colours for the non-metal areas. I just need to apply a few highlights now and they’ll be done. “Murders and elf-friends!” the Great Goblin shouted. “Slash them! Beat them! Bite them! Gnash them! Take them away to dark holes full of snakes, and never let them see the light again!” He was in such a rage that he jumped off his seat and himself rushed at Thorin with his mouth open. Here is the latest denizen of Middle Earth to come off my painting table: the Great Goblin (apparently referred to as the ‘Goblin King’ in New Line’s merchandising). I loved the portrayal of the Great Goblin in the film (ably played by Barry Humphies) and GW’s model captures the character perfectly. It is a fantastic model which has some great textures considering the fact that it is plastic. The skin was basecoated with Tallarn Flesh. Even though most of this stage would be completely painted over on the finished model it would give the skin tone an underlying warmth. This is because even though the Great Goblin is pallid and unhealthy he is not a zombie or Nurgle model and so should still look as though he is alive. 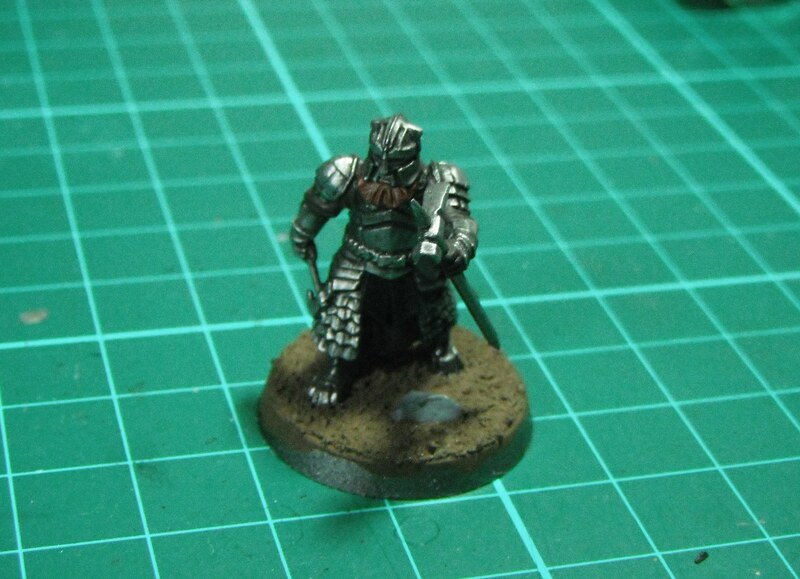 The skin was then painted with a 50/50 mix of Tallarn Flesh and Space Wolf Grey. 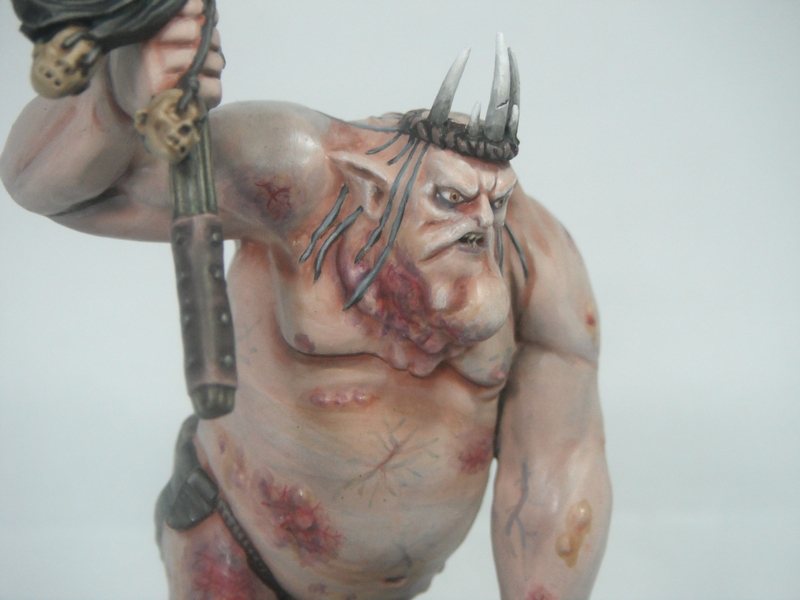 This was washed with Ogryn Flesh mixed with Lahmian Medium and allowed to dry. This was followed by more targeted washes applied directly to the recesses using Ogryn Flesh and Agrax Earthshade. 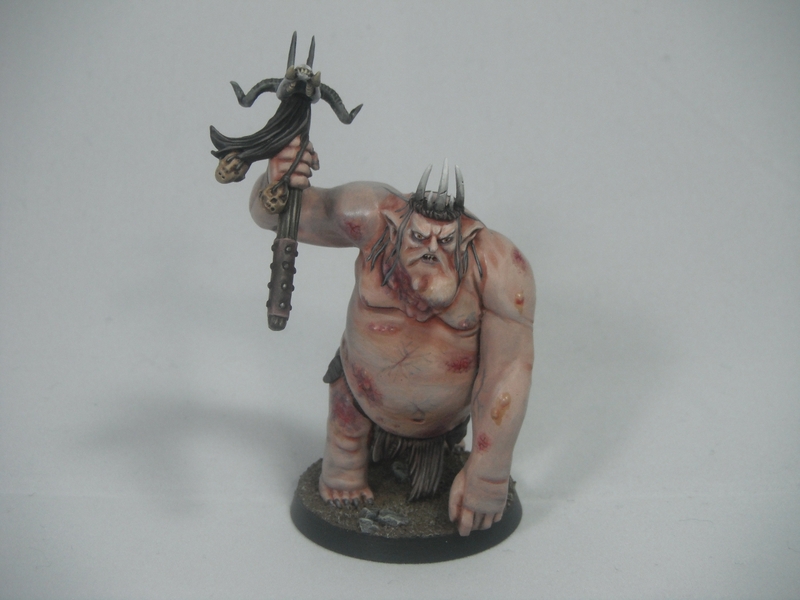 I then highlighted the skin with the original flesh mix with increasing amounts of white added. The purple/red lesions on the skin were glazed using a mix of Leviathan Purple and Tallarn Flesh. The yellowish areas were glazed with Seraphim Sepia. At this stage the skin was looking a little too warm and so was glazed with thinned down Guilliman Blue in order to give it a slightly cooler tone. 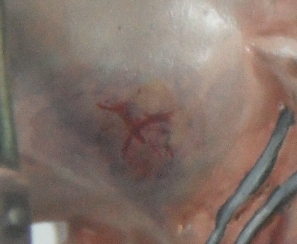 The lesions on the skin were built up further by adding glazes of Leviathan Purple, Bloodletter, Ogryn Flesh and Seraphim Sepia. I tried to copy the look of real bruises. 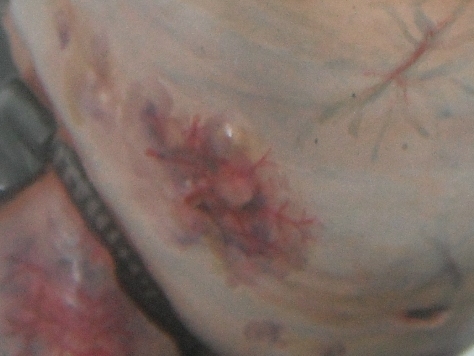 In order to make the model look really disgusting (more so than he already was) and to add visual interest to such a large model I painted veins and texture on the areas of bruised and broken skin as can be seen in the close-ups below. This was done with a mix of Scab Red and Leviathan purple. 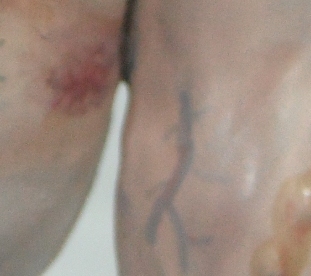 Veins were also painted on the undamaged skin using Guilliman blue. The blue veins were then glazed over using Tallarn Flesh and then Pallid Wych Flesh. This was to tone the colour down and to make them appear to be beneath the surface of the skin. 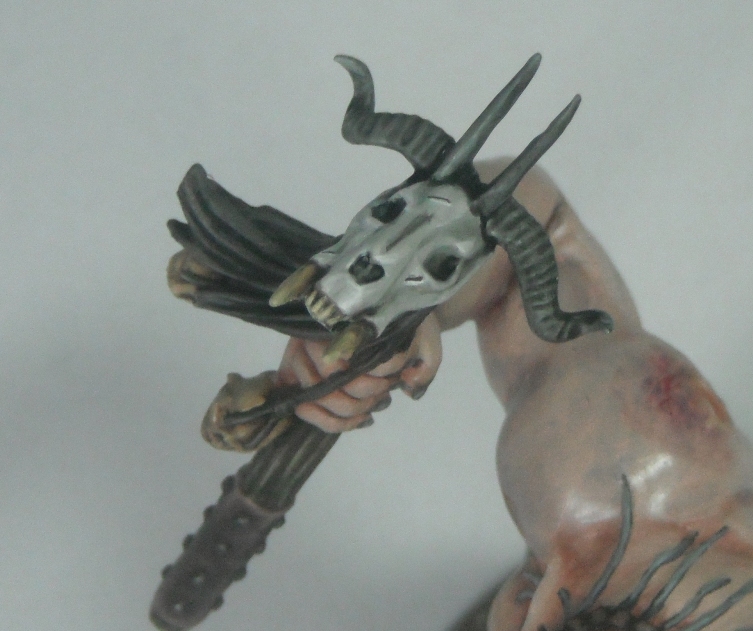 The face was highlighted by adding Pallid Wych Flesh to Tallarn Flesh and working up to pure Wych Flesh. The eyes and mouth were then glazed blue and purple. 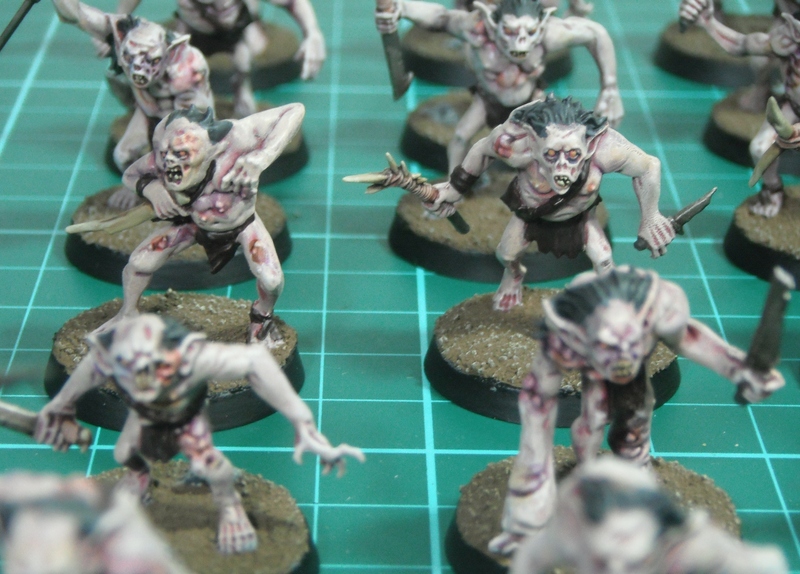 The eyes were painted Pallid Wych Flesh and the irises were painted using Ballor Brown edged with Mournfang Brown. The pupils were painted in black. All in all a suitably disgusting and grotesque paint job for such a foul character. Let me know what you think by leaving a comment below. Now, on to the dwarves. Now goblins are cruel, wicked, and bad-hearted. They make no beautiful things, but they make many clever ones. They can tunnel and mine as well as any but the most skilled dwarves, when they take the trouble, though they are usually untidy and dirty. Hammers, axes, swords, daggers, pickaxes, tongs, and also instruments of torture, they make very well, or get other people to make to their design, prisoners and slaves that have to work till they die for want of air and light. It is not unlikely that they invented some of the machines that have since troubled the world, especially the ingenious devices for killing large numbers of people at once, for wheels and engines and explosions always delighted them, and also not working with their own hands more than they could help; but in those days and those wild parts they had not advanced (as it is called) so far. As mentioned in an earlier post, I finally succumbed and purchased the ‘Escape from Goblin Town’ boxed set. 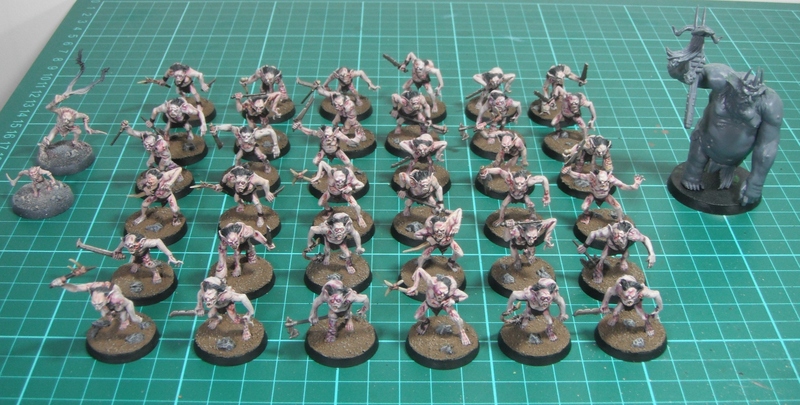 Initially I was reluctant to buy such a large set as I didn’t want to end up with lots of models that I never got round to painting and ‘Escape from Goblin Town’ contains 36 goblins! 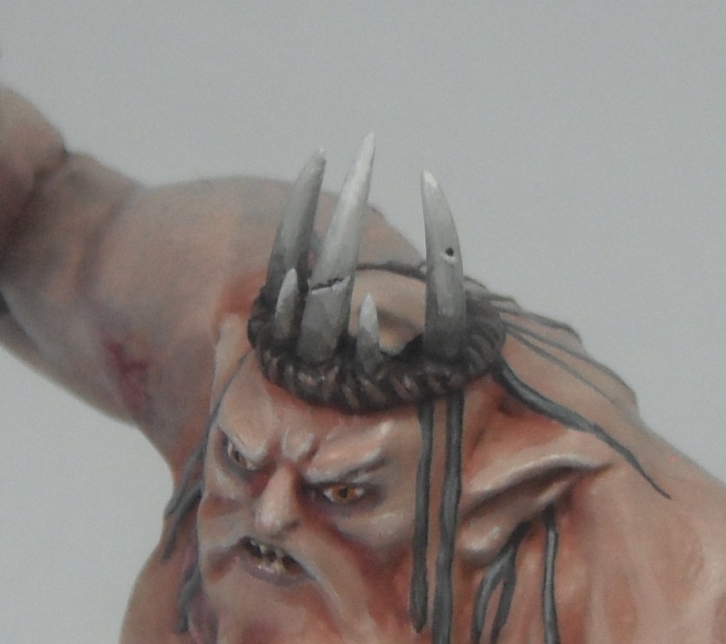 In the end I resolved to find a quick and easy way to paint the goblins, allowing me plenty of time to devote to each member of Thorin’s company. Although I usually paint each and every model to the best of my ability I knew that if I attempted this with so many similar models I would never get through the lot. 1) Basecoat Dheneb Stone using an airbrush. 2) Wash the whole model with a heavy application of Baal Red. 3) Drybrush the goblins Elf Flesh. 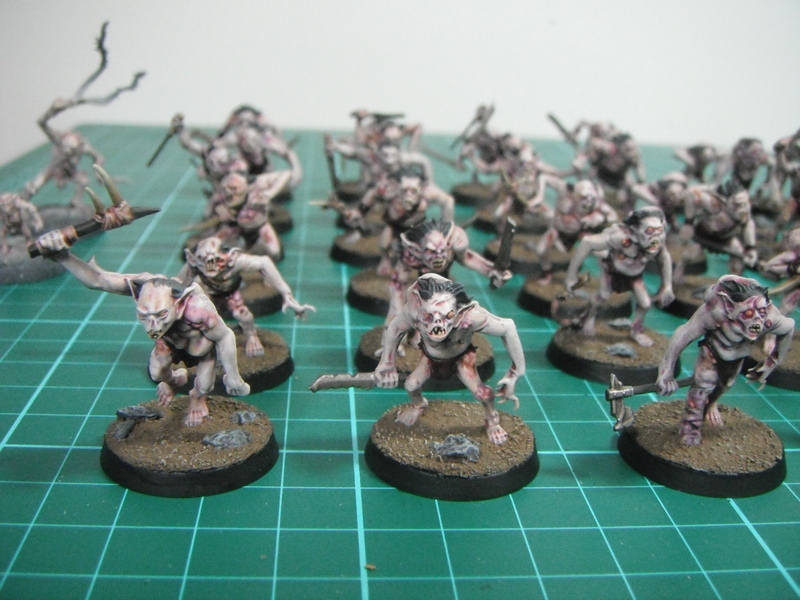 4) Give the goblins a lighter drybrush of Pallid Wych Flesh. 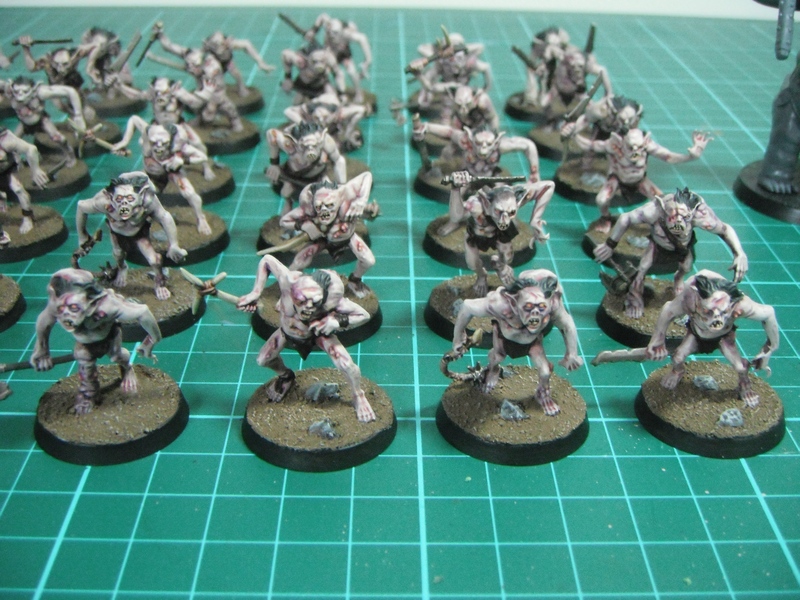 5) Apply purple, red, sepia and blue washes and glazes over the rotten and diseased parts of the goblins as desired. This was a very quick process and produced some good results. On the whole I am very pleased with these and, although not my best work, they are painted to a pretty decent tabletop standard. Here is my latest model from The Hobbit range, Radagast the Brown. This is probably my favourite of the Hobbit releases so far. It’s a really elegant sculpt and the little model of Sebastian (the stricken hedgehog aided by Radagast in the film) really adds something to the spirit of the piece. Because in the film Radagast’s robes are all very similar in tone I decided not to try and replicate the look from the film exactly as it would result in a very boring, undefined miniature; what works as a costume on film doesn’t necessarily work on a 25mm model, it’s just a question of scale. With models like this I think that the overall effect is more important than exact verisimilitude to the film. However, hopefully my paint job captures something of the essence of the character. Another of my Hobbit themed models, this time Gollum. 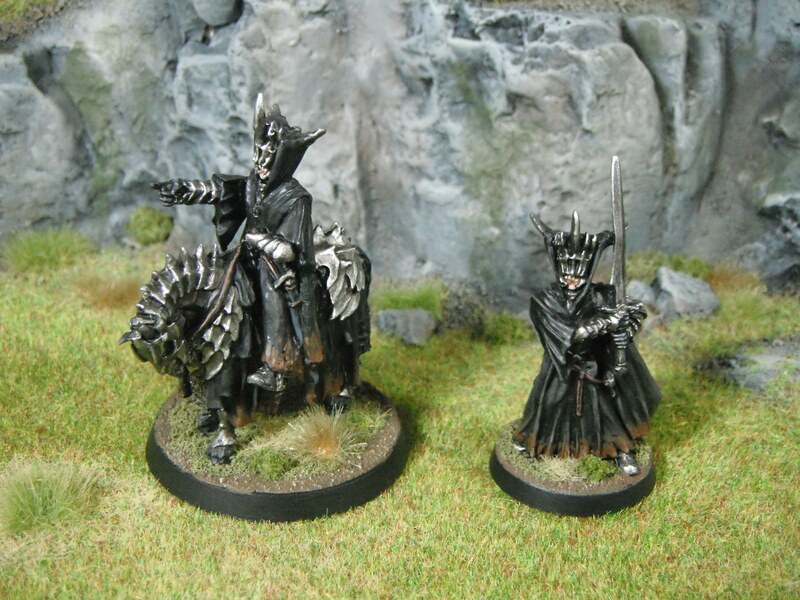 As with the White Council, this model is taken from the Lord of the Rings release rather than the new range of models released for The Hobbit. 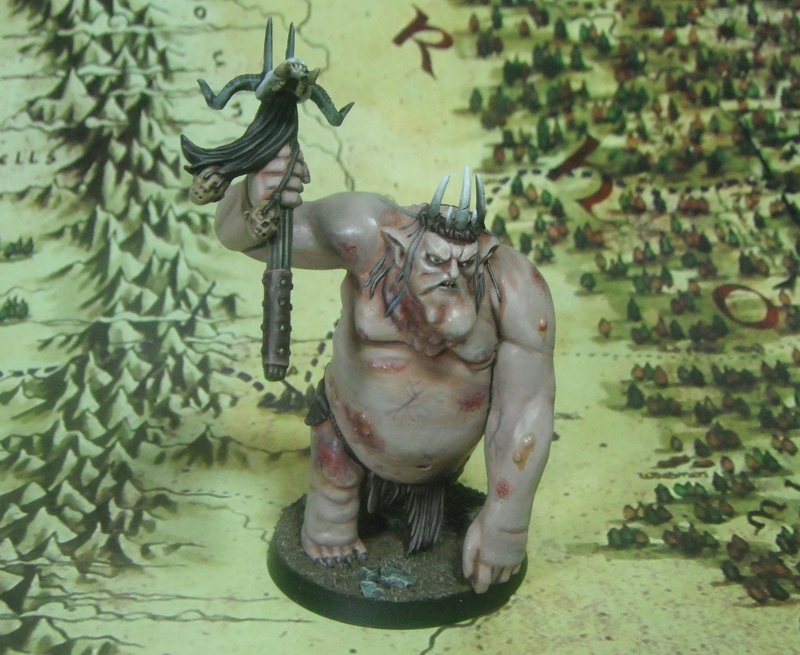 This was a fun little project and quite quick to paint (the whole model is largely one colour). The rock was drybrushed first and then I painted Gollum himself. The skin started with a basecoat of Tallarn Flesh with a bit of Codex Grey added to remove some of the warmth of the colour and make Gollum look a little less healthy. This was washed with thinned Dark Flesh followed by a more precise application of Scorched Brown in the deepest recesses. 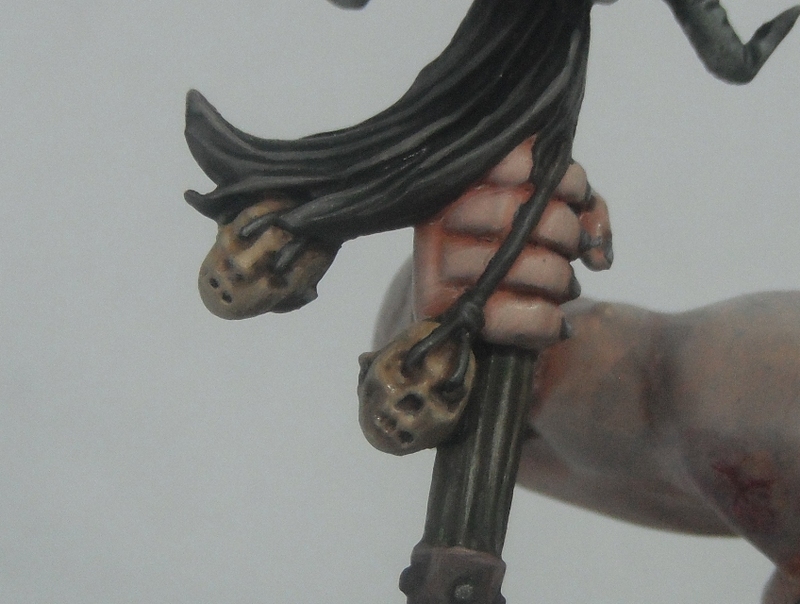 I then highlighted the model by adding increasing amounts of Bleached Bone to the basecoat. I then added a tiny bit of White Scar for the final highlight. In the photo below you can see the scars on Gollum’s back. These were picked out with Tanned Flesh and highlighted by adding Bleached Bone. 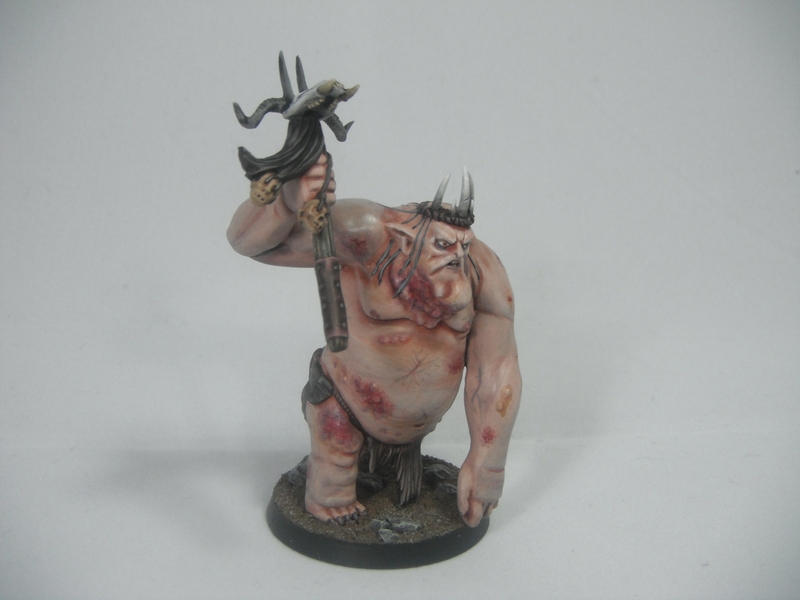 I also used a little bit of Baal Red around the edges to add to the effect of the scar tissue. I added some clump foliage and flock to the base to match the look of Emyn Muil in the film and to tie Gollum in with my other LotR/Hobbit models. 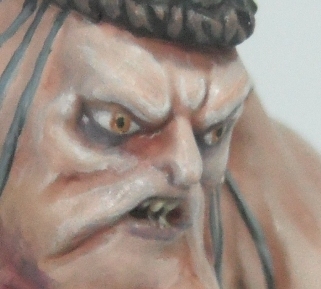 It also adds a bit more realism tot he rocks which are rarely as bare in real life as they often are on model bases. I hope you like Gollum and my other Hobbit models. 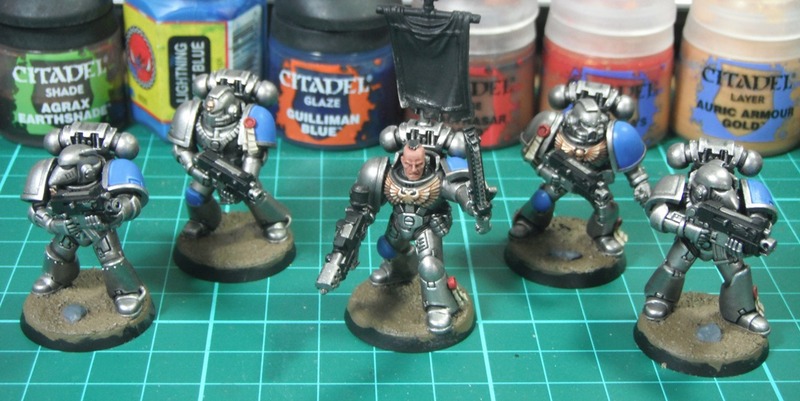 In my next blog post I will be returning to the grim darkness of the 41st millennium with some more Dark Angels. As mentioned in a previous post, it was my intention to try and paint all of the White Council before the release of The Hobbit as a kind of ‘count down’ project. Well here they all are finished. As these have been completed ahead of schedule I have started work on Gollum who will hopefully appear in another post later in the week. Here is the final model to be painted for the White Council, Elrond of Rivendell. Now I know this isn’t the ‘official’ model of Elrond, rather it is meant to represent Celeborn. However, I don’t really like the unarmoured Elrond model GW produce and so I was searching around for an alternative and I found this model in my collection. I think it suits Elrond very well. The model has quite an unusual colour palette which I would not have chosen had there been no existing depiction of Elrond to work from. The lilac robes were painted with a mix of Space Wolf Grey and Warlock Purple highlighted by adding white and a little bit of Bleached Bone to stop the colour becoming too cold. The warm brown robes were painted Dark Flesh and highlighted Vermin Brown followed by a Vermin Brown and Vomit Brown mix.